"The only time I feel on top of the world is when I'm fighting." 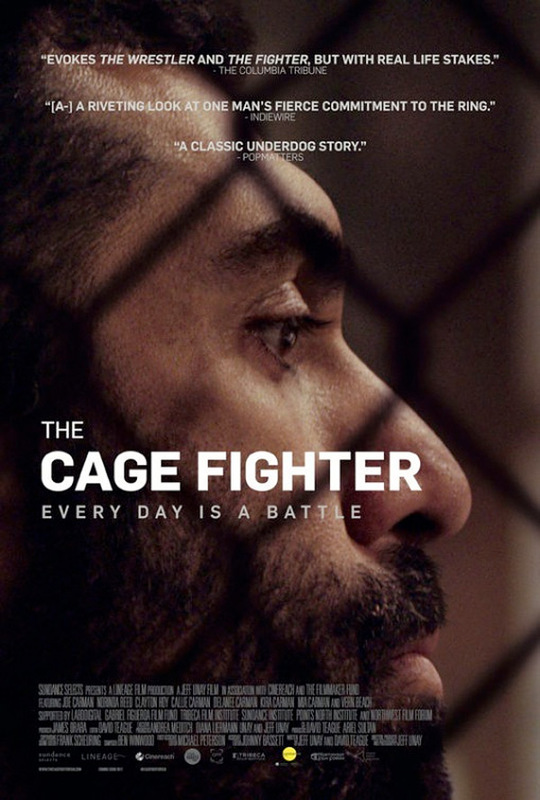 IFC Films has debuted the official trailer for a documentary titled The Cage Fighter, which premiered at the True/False Film Festival last year. This docu-drama from director Jeff Unay plays like a feature film with a narrative following the real-life story of a fighter named Joe Carman. Joe is a blue-collar family man who breaks the promise he made years ago to never fight again. Now forty years old, with a wife and four children who need him, he risks everything – his marriage, his family, his health – to go back into the fighting cage and come to terms with his past. Carman stars, and the film's "cast" (if you can call it that) includes Norinda Reed, Clayton Hoy, Callie Carman, Delanee Carman, Kira Carman, Mia Carman, and Vernon Beach. This is a helluva trailer, damn. A promising look at a powerful, personal film about the demons that drive a man to push himself to the limit. When life hits him hard, Joe Carman punches back. Newly 40, Joe juggles long hours working in a boiler room, an ongoing custody battle, his wife’s chronic illness, and the demands of raising four girls. The one place he finds release is in the ring, where he competes in the bruising sport of mixed martial arts. Despite the promise he made to his family to stop fighting, Joe continues to train secretly, determined to prove that he can keep up with the new crop of younger, up-and-coming competitors. But as he contends with a series of increasingly worrying health scares, the question arises: how much is Joe willing to risk—his family, his marriage, maybe even his life—to keep fighting? The Cage Fighter is directed by up-and-coming filmmaker Jeff Unay, who worked on VFX at Weta before making his directorial debut with this film. This first premiered at the True/False Film Festival last year, and also played at Sheffield Doc Fest and AFI Docs. IFC will release Unay's The Cage Fighter in select theaters + on VOD starting February 2nd. Who's down?